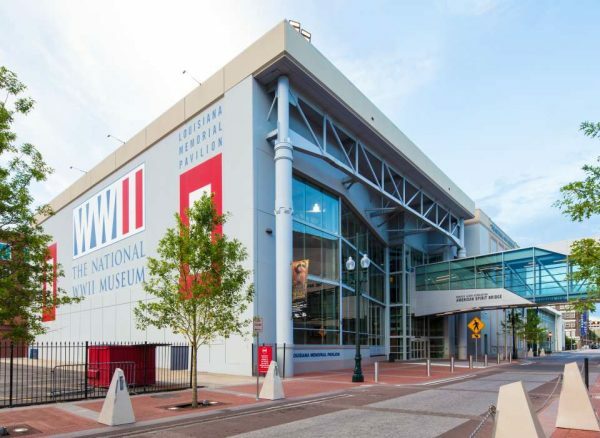 The National World War II Museum in New Orleans. On Tuesday I posted “My family’s anti-Trump travelogue” on Rocky Mountain Post sister site RealVail.com, explaining the historical teaching moments we’ve experienced during our last year of travel both domestically and abroad. I’m reposting that blog on RMP now (see below). But first, one Facebook reader pointed out a serious omission I made. I neglected to include the trip my two oldest sons took with my father-in-law on an Eagle River Presbyterian Church mission trip to work construction on an orphanage in Haiti last month. Because I wasn’t there, I didn’t think of it as a parental teaching moment, but of course it was probably the best learning experience my boys have had since the election of Donald Trump last November. While Trump’s administration attempts to boost defense spending, it is also slashing funding for social programs many experts feel are a far better way of spreading American influence overseas. The Haiti trip was privately funded, but the federal government is also critical in offering aid and assistance to impoverished and disaster-stricken areas of the globe. Soon after I posted my travelogue Tuesday, Trump held a press conference at which he asserted there were “some very fine people” among the neo-Nazis, white supremacists and KKK members who marched on Charlottesville over the weekend under the guise of protesting the removal of a statue of Robert E. Lee, who led the confederate armies during the Civil War. These comments prompted Scott Paul, whom I interviewed last summer, to quit Trump’s Manufacturing Jobs Initiative – a program vital to economically diversifying Colorado’s Western Slope. Paul was right to quit over comments that can only be viewed as sympathizing with Nazism – a scourge that cost tens of millions of lives during World War II. But the only CEO Trump singled out for criticism over his resignation from the initiative was African-American CEO of Merck Kenneth Frazier – yet another sign Trump is at the very least a closet racist who is now on the verge of institutionalizing bigotry in the White House. On Wednesday, Trump dissolved two of his business councils in order, he said via Twitter, to take pressure off CEO’s debating whether to quit over his Charlottesville statements. So rather than walk back his support for racist groups, the president who was elected to add jobs and improve the economy is disbanding business groups intended to expedite that process. But those businessmen still deserve condemnation for supporting a man who very early in the campaign process showed he was capable of incredibly divisive hate speech. I called for his ideology to be rejected all the way back in March of 2016, and Trump has not pivoted in the nearly year and half since. If anything, he’s shown his true colors in recent days and is taking our nation down the darkest of paths. It is now the most liked tweet in the history of Twitter. Over the last year I’ve used family vacations and travel abroad to try and impart historical lessons my three boys can hopefully use to put current events into proper historical perspective. My parents, dragging my siblings and I around the world for work and pleasure, did the same. Andrew Higgins designed and built the boats, also known as Landing Craft, Vehicle, Personnel (LCVP), in New Orleans, and as a kid about Rennick’s age in the mid-1970s I dug into the rotting frame of an LCVP on Omaha Beach in Normandy, France. My brother and I, just 30 years after the largest amphibious invasion in military history, unearthed burn ointment, gloves and other medical supplies at a time when much of the debris depicted so vividly in the first 20 minutes of “Saving Private Ryan” still littered the sand. My parents took us to Normandy on vacation while my late father, a career U.S. Air Force officer, was stationed in northwest Germany, near where General George Patton’s tanks rumbled through months after the D-Day invasion. “Patton” is another worthwhile World War II film focused on the power of personality and tough-talking bluster backed by overwhelming force. Our current president – despite repeatedly evading military service for dubious medical reasons and to study during the Vietnam War (where my father served) – now employs Patton-style saber-rattling on Twitter after campaigning on an isolationist platform casting aspersions on the current and ongoing U.S. military engagements in Iraq and Afghanistan. Now Donald Trump is drawing red lines all over the world and daring dangerous and unstable dictators to cross – to the point of losing credibility and (hopefully) cementing his legacy as an all-talk, no-action bully. The exact opposite of former President Theodore Roosevelt’s “Speak softly and carry a big stick” foreign policy that landed the progressive a Nobel Peace Prize. A year ago as Trump’s improbable and at the time unthinkable presidential run was becoming a reality, we took our boys to Yellowstone National Park – the crown jewel of Roosevelt’s most lasting legacy – and I explained to them how damaging an anti-environment, conservation-adverse Trump presidency could be. Now that possibility is a terrible reality. And in February, just weeks after Trump’s dark and fear-mongering inaugural speech, we traveled to Mexico in defiance of the reality TV star’s pandering to a xenophobic, isolationist and immigrant-bashing base. We were heartened to see Americans wearing “Yo no voté por él” t-shirts on the beaches of Cabo San Lucas. As a Mexican tourism destination, our home here in Vail has been culturally, economically and socially tied to Latin America for decades, and the least we can do is continue to spend our travel dollars there. Finally, my wife and I traveled to Chicago over the summer, enjoying all the great food, music and culture (Museum of Contemporary Art is amazing) America’s Second City has to offer. It also happened to be the most violent weekend of the summer, although we were far removed. It’s disgusting to see Trump now retweeting a vilified conspiracy theorist trying to point to black-on-black violence in Chicago as some sort of justification for Trump’s botched response to white supremacist violence in Charlottesville over the weekend. The proper response is to condemn fascism while working on economic and social policies to alleviate inner-city violence. I wrote in November that Trump’s election felt chillingly similar to what Germans must have experienced in the 1930s. Nine months later nothing has happened to make me walk back those words. In fact, I would argue Trump has merely doubled down on hate speech and policies aimed directly at dividing and conquering the nation to benefit extremists. Disavowing neo-Nazis and Klan members 50 hours after one allegedly plowed his car into a group of peaceful protesters – while not at all rejecting their open support for his presidency – amounts to a very hollow gesture by an increasingly unhinged and dangerous president. Nothing short of ousting Steve Bannon and other alt-right policymakers from his White House and supporting and implementing policies aimed at promoting diversity will suffice at this time of mounting fear and uncertainty for the United States and the world.